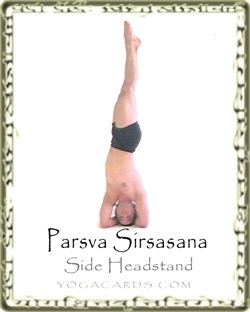 This is this Side Headstand. It is entered from the Headstand. Rotate the legs keeping the tailbone tucked in. Allow the elbow on the side you twist too to open a little. This will allow better balance. Try to keep the head and nec straight. Allowing the chest to open will create an arch in the back and allow you to twist more. Opposite you can see the Side Headstand with the very vertical line and the deep version which is a little harder on the lower back. Try to keep the legs pushing together in the way. You can point through the toes, heels or ball points of the toes. Do not allow the neck to collapse on one side. Be aware of both sides of the neck and the strength and energy that runs down them. Always tuck the navel in to create a lock in the abdominal region. This will help to maintain stability in this area and take some pressure off the discs in the lower back. Breathing really shifts the body during this posture. It is hard to maintain balance while breathing deeply. Therefore enter with an exhalation and breath light, shallow breaths until confidence in balance is gained. Slowly deepen the breath while maintaining balance. One side of the neck is compressed while performing this posture. Look at the picture opposite. Make sure this does not compress too much. The elements must still flow through the neck. It is natural to twist as much as possible. Do not over twist in postures that require balance. It will interfere with breathing. Clasping the hands in this way seems to protect the neck. It is probably a better choice for supporting the neck. There is many different arm positions to experiment with once students have gained confidence in this posture. There is also many positions for the feet and legs.